The newest bugaboo of the gun control crowd is the bloodcurdling "3D printer gun" -- or, as anti-gun activist Alyssa Milano called it, "downloadable death." 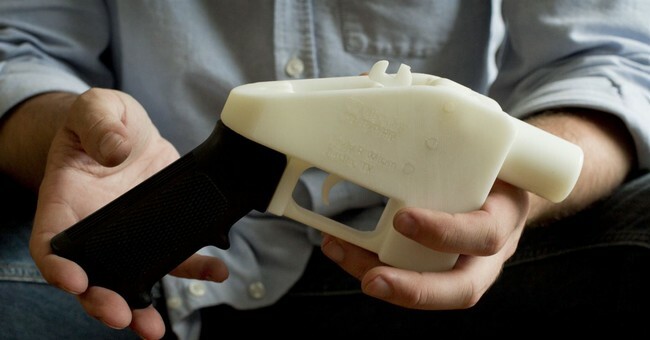 Reporters at CNN now ask, "3D guns: Untraceable, undetectable and unstoppable?" Even President Donald Trump tweeted that he's "looking into 3-D Plastic Guns being sold to the public. Already spoke to NRA, doesn't seem to make much sense!" First of all, 3D plastic guns aren't being sold to the public. Neither are "downloadable firearms" or "ghost guns." These things don't exist. Data, code and information are being sold to the public. There is no magical contraption that creates a new gun on demand. Sorry. Even if such a machine existed, however, the Trump administration hasn't suddenly begun "allowing" Americans to fabricate guns in the comfort of their homes as so many stories have intimated. It's never been illegal to make your own firearms in the first place. The pretext for this freakout is news that the State Department reached a settlement with Cody Wilson and his company, Defense Distributed, which offered digital designs for 3D printed guns, not guns. The Obama administration had maintained that the company's printer code violated the International Traffic in Arms Regulations, which had little to do with a law-abiding hobbyist milling a lower receiver for a commercially popular civilian firearm in his suburban Pennsylvania garage. Milano may not be aware that Americans have been building their own three-dimensional guns since before the Revolution. Today life has become far more convenient, and schematics that offer hobbyists plans for assembly or creation of firearms can be found across the internet. Although people might need a high degree of proficiency to pull off making one, they certainly don't need a 3D printer. One seven-part video on YouTube features an industrious fellow turning hundreds of cans of Pabst Blue Ribbon into an AR-15. Still, Milano contends that the administration's decision now means that "felons, domestic abusers, terrorists, those adjudicated too mentally ill to own guns and any other person unable to legally purchase firearms will be able to print one at home." Guess what. If you're unable to legally purchase firearms, you are already prohibited from making a gun in your home, just as you are prohibited from buying a gun through a straw purchase or stealing one from your neighbor or smuggling one into the country. That's settled law. Good work. Censoring code on the internet simply because you find guns objectionable, though, is another story. As Wilson told The Washington Post, code "is the essence of expression. It meets all the requirements of speech -- it's artistic and political, you can manipulate it, and it needs human involvement to become other things." How can the state ban the transfer of knowledge used to help someone engage in an activity that is completely legal? Scratch that -- to engage in an activity that is constitutionally protected? You might also wonder why criminals would bother spending thousands of dollars to create a one-shot plastic gun (that probably wouldn't work) when they can walk into a store and buy a reliable shotgun for a few hundred dollars or procure a weapon illegally for far less? Well, I'm assured by Milano that these 3D-printed plastic guns are undetectable and easy to make. Neither of those things is true. It's already illegal for Americans to possess weapons that are undetectable by metal detectors (even if metal detectors aren't used at airports anymore). So don't make one. But the Defense Distributed plans for a complete AR-15 include 72 parts, some of which are composed of metal to prevent catastrophic malfunctions. Is a mastermind criminal going to 3D-print or mill all those parts himself, a task that requires not only considerable knowledge, skill and experience but also a costly printer and custom machine shop? This technology has been available for years. Has there been a crime wave of undetectable AR-15s? What Sen. Ed Markey, D-Mass., wants to do is pass legislation that curtails the rights of law-abiding citizens by fearmongering over a settlement that had nothing to do with the legality of homemade guns in the first place. As always, gun restrictionists are interested in adopting incremental steps toward more obstructive gun laws. In this case, they are aiming to limit hobbyist manufacturing in general. The entire case against 3D guns is propelled by the notion, normalized over many years, that access to firearms is problematic, even though the presence of guns doesn't equate to increased violence. And who knows? Perhaps one day, as machines evolve and become more reliable and powerful, it won't be prohibitively expensive for the average law-abiding person to make his own AR-15. Whether that would be a positive or a negative development is debatable. But gun control activists are trying to dictate what that future looks like now.